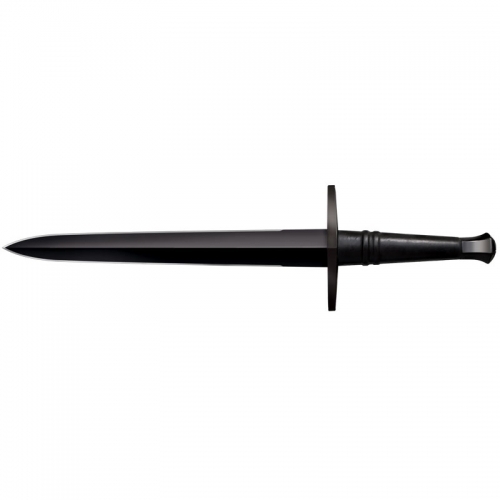 History of the Seax Knife A scramseax (also scramsax, scramseaxe, scramaseax, scramasax, scramaseaxe and sometimes referred to as simply scram, seax or sax) was a type of Germanic single-edged knife. Scramseax seem to have been used for warfare and as a tool. They occur in a size range from 2.9″ to 29.5″. The larger ones (langseax) were probably weapons, the smaller ones (hadseax) tools, intermediate sized ones serving a dual purpose. Wearing a scramseax may have been indicative of freemanship. The scramseax was worn in a horizontal sheath at the front of the belt. Scram refers to food and seax to a blade (so, “food knife”). There is some debate about the authenticity of the longer word scramseax. The Saxons may have derived their name from seax (the implement for which they were known) in much the same way that the Franks were named for their francisca. This claim is largely supported by the appearance of scramaseaxes in early Saxon heraldry. 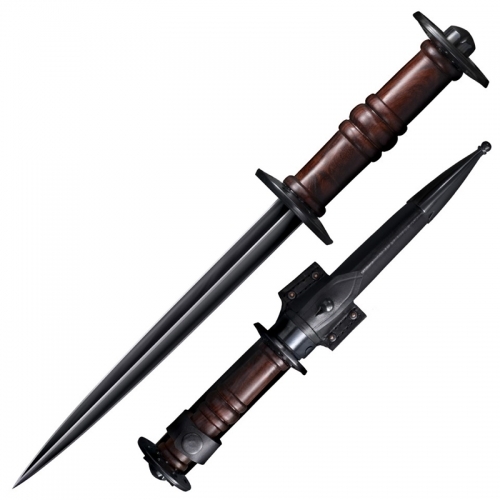 The Generation2/Legacy Arms version is based off a 10th century style and if you notice it is a nice match to the Witham Viking Sword as the pommel and cross guard are also solid carbon steel with copper diamond inlays, then highly polished. 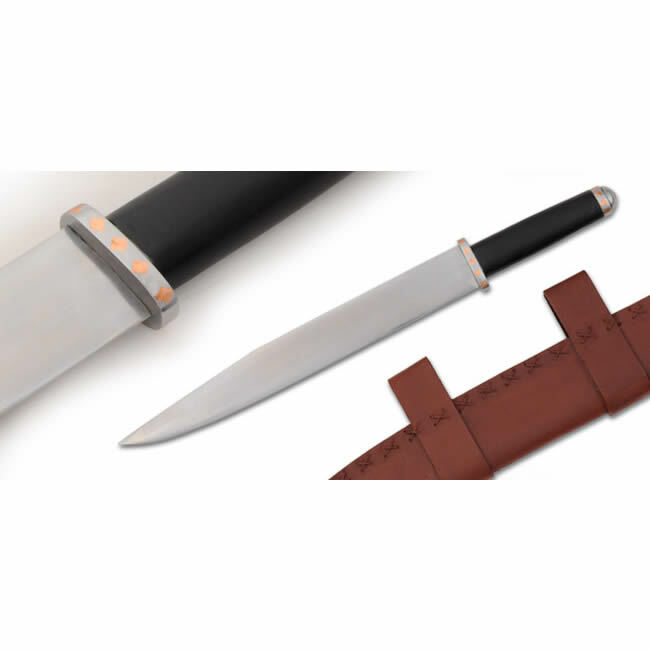 The Blade is 5160 tempered carbon steel with a wood handle, wrapped in brown leather. The tang is peened over top the metal end cap of the handle. A hand stiched Leather brown scabbard with belt hanger is included. Made by Legacy Arms. Key Features: leather wrapped wood handle peened tang hand stitched leather scabbard w/belt hanger included Overall: 17 1/4″ Blade Length: 12″ Handle Length: 5″ Weight: 14.4oz Point of Balance: 1 3/4″ below guard Blade Steel: 5160 Specs will vary slightly from piece to piece.